If you’ve decided that you want to freshen up your garden by building a brand new patio, then congratulations – it’s a great idea. A patio provides an area to entertain friends and families at BBQs and summer parties, it can be a quiet and relaxing place for you to retire to on a summers evening and it can even increase the value of your home. You’ve probably got lots of questions about the job on your hands, but arguably the first and biggest one is where to begin? Luckily, help is at hand. We’ve put together this step by step guide to getting the design, the position and the cost of your brand new patio just right. There are a few considerations to take into account before deciding on the location of your patio. The first is that it needs to be easily accessible, weatherproof and away from any sources of water in order to ensure that you get maximum benefit and usage out of it. The second is that it should be in a private area of the garden. When you’re relaxing on a patio, the last thing you want is for it to be possible for other people to overlook the patio or see what you are doing. Choosing a spot which gives you maximum privacy is therefore important. You should also be considerate of what the patio will mean for your neighbours. Don’t block their light and ensure that the location has no effect on the drainage of either yours or the properties around you. The last thing you want is a damaging, nightmare neighbours style dispute with those around you. Step 2 – What is your patio going to be used for? Once you’ve got the location nailed, you need to decide exactly what you want your patio to be used for. This will influence the size, material, and cost of the patio. If you want an area big enough to house plenty of Lloyd Flanders patio furniture, then you’ll probably need quite a large patio. It’s the same if you are looking to incorporate an ambitious building project like an outdoor kitchen into the plan. You might be intending to use the patio as a play area for children, in which case the materials used will need to be more child friendly than if it is an adult-area section designed for drinking a few glasses of wine while you unwind after a long day. Finally, there is a cost element. You could, in theory, pave your entire garden depending on its size and then never need to worry about mowing the lawn again. For a small garden, that is certainly feasible. For bigger properties or for those homeowners who want to maintain a good amount of grass, it’s probably not an option. There are traditionally two styles of patio paving to choose from. If you are looking for a modern look, then polished sandstone, low chamfer blocks and porcelain are among the materials to use. For a rustic, more traditional feel then look at riven sandstone flags or tumbled block paving. What style you want will normally be decided by the rest of your property. If you like in an older home, chances are you’ll want your patio to have a more rustic look to fit in with the rest of the building. The opposite could be true of a newer house. 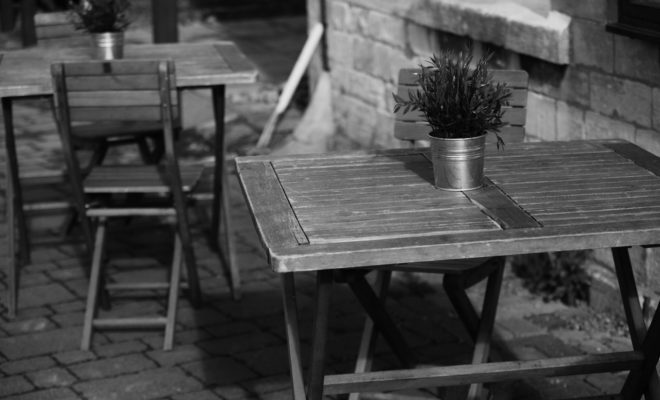 Step 4 – Do you need planning permission for the patio? You need to assess whether you need planning permission for your patio. In most cases, you won’t – homeowners are free to do whatever they want at ground level around their properties. The exception is if your patio requires significant works of embanking or terracing in order to support a hard surface. If you’re in any doubt, then contact an expert. Having to tear up your patio after it is installed because of a planning issue is a costly and timely expense. You also need to seek permission if you live in a listed building. Step 5- Are foundations going to be required? Depending on what you are building will decide on whether you need foundations underneath the patio and if so, how deep and strong. Garden paving slabs generally need a solid foundation between 5 and 20 cm deep to ensure no movement. Brick can lie on a bed of compacted sand which placed over a thick sub-base and paths can usually just be sunk into the ground. This is one stage you can’t afford to get wrong so again, if you are unsure ask a professional contractor. You don’t want to create your perfect patio only for it to start subsiding within six months due to inappropriate foundations. Step 6 – Who is going to build the patio? The final step in the building process comes with deciding who is going to build the patio – will it be a DIY job or are you going to bring in a firm of experts? Both routes have their pros and cons, and the decision will probably come down to timescale, budget and confidence. Building the patio yourselves will reduce the cost as you won’t be paying out for labour. You are also more likely to love and cherish the patio knowing that it was all your own hard work and sweat that was poured into it. Hiring a professional might drive the budget up, but it should put the patio on track to be built in a more realistic timeframe as a landscaper will have the job as their sole focus and not have to fit in working on it around a 9-5 job and other commitments as you would. Once the patio is built, then the final stage comes – namely, furnishing it. There are all kinds of finishing touches you can add to a patio, ranging from furniture to lighting. Build a BBQ for those summer parties, getting planting around the borders to surround the new structure with nature and don’t forget the chiminea or fire pit so that you can stay outside long after the sun has taken the warmth of the evening with it.